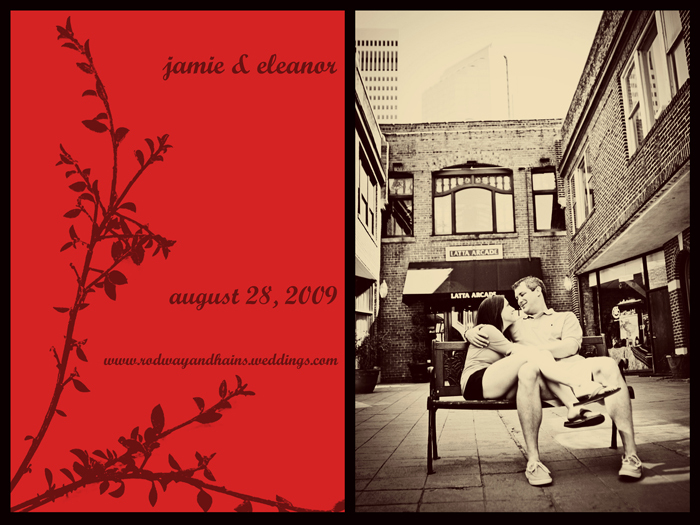 Here is one I made for Jamie and Eleanor [you can find them a few posts before this] recently. They are both so simple and down to earth and they are so easy to work with...and here is a simple creation for them...i think it is fitting. It was so rewarding working on this because i had to teach myself some new photoshop skills...I'm a little more familiar with doctoring a creation than actually creating a creation. If you are a photoshop guru then you are probably laughing at my "new skills." The left is the front and the right is the back and they are printing it as a 5 X 7 card. It is crazy how many photoshop tutorials and helper sites there are on the web...so this is my encouragement to the world: if i can do it, you can do it. Don't be afraid of photoshop!